The Ontario Sustainable Energy Association (OSEA) is disappointed to hear that the Ontario government decided to suspend the second round of its Large Renewable Procurement (LRP) program. While the program was certainly not the most effective in ensuring meaningful community participation and ownership opportunities, it was a program that allowed the province to move in the right direction as it pertains to meeting our climate change and emission reduction goals. The decision plays into the misinformed belief that renewable energy generation is expensive and nuclear power is cheap. Earlier this year, when projects were awarded contracts under the first round of the large renewable procurement, renewable energy developers proved that their projects can come in at highly competitive rates, even below the advertised rate of nuclear refurbishments. And while the prices for renewables continue to drop, the total cost implications of nuclear refurbishment are not yet entirely known. What we do know is that no nuclear power project in Canada has come in on time or on budget. This decision also stands in stark contrast to the government’s recently released Climate Change Action Plan that encourages the move towards a distributed energy system that is powered by renewable sources. This plan has led the Independent Electricity System Operator (IESO) to release two demand forecast scenarios that foresee an increase in electricity demand of up to 40% due to the introduction of electric cars and the push towards the use of electricity for our water and space-heating needs. (See IESO Demand Forecast) Considering that the IESO forecast, that was released earlier this month, still factors in the supply from the 1000 MW that was going to be brought online under the second round of LRP, how is this additional demand going to be satisfied? It also begs the question why does the government continue to support a bulk electricity system when all the evidence shows that a decentralized energy system is more flexible, more efficient, less cost-intensive, and allows better engagement and involvement of the community? By sticking to the bulk electricity system, our government risks stranded assets that we, our children and grandchildren will have to pay for decades to come. If the government was truly concerned about the costs of our energy system, it would take a long-term, integrated (heating, cooling, electricity and transportation) and systematic approach to energy planning and be transparent about the process. This is why OSEA and its members have been developing the Combined Energy Options Ontario proposal for the past year. The proposal is for a holistic study of Ontario’s energy system to develop a model and simulation that would allow us to understand how we can build a low-carbon, sustainable energy system in the most cost-effective, efficient, and socially responsible way. While the news of the LRP suspension has certainly been discouraging, OSEA will continue to engage actively with the government on the development of the next long-term energy plan, championing the transition to a decentralized, integrated, inclusive and sustainable energy system that is built on portfolios of technological solutions that satisfy Ontario’s electricity, heating, cooling, and transportation needs and that puts the needs of Ontario’s communities first. The Ontario Sustainable Energy Association (OSEA) is championing a prosperous Ontario with a thriving sustainable energy sector, good jobs, resilient communities and healthy environments powered, heated, cooled and moved by portfolios of sustainable energy by raising public awareness, advising decision makers and establishing forums for new market opportunities and collaboration. Find us on the web at www.ontario-sea.org. 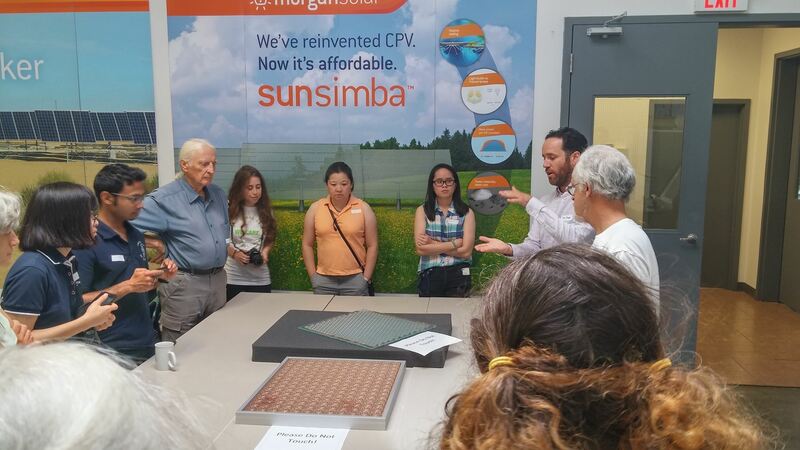 Sustainable energy champions and leaders in sustainability across Ontario, Alberta and British Columbia opened their doors this past weekend, showcasing their projects and sharing their experiences. More than 200 venues opened their doors, demonstrating a variety of technologies from solar, wind, and geothermal, to energy-efficient buildings, electric vehicles, as well as featuring different ways of living sustainably. Over 10,000 visitors utilized this opportunity to learn and exchange ideas with homeowners, members of community groups, organizations, and business who are the trailblazers that lead the way for climate action. “Climate change is a cause of concern for many and the Ontario Sustainable Energy Association (OSEA) is proud to be able to showcase solutions to our climate change challenge through this initiative. Green Energy Doors Open consists of the annual showcase and a blog with stories, videos, podcasts and case studies that enable people to share ideas and learn from each other all year round,” says Nicole Risse, OSEA’s Executive Director. "Buildings and transportation account for about 70% of greenhouse gas emissions in urban centres, so greening our buildings is essential. The good news is that it's doable. At TD, our green building program is the key reason we've been able to reduce GHG emissions from energy by 20% since 2008, despite occupying 26% more space," says Karen Clarke-Whistler, TD's Chief Environment Officer. "Green Energy Doors Open is a great opportunity to see a huge range of innovative green buildings. It's incredibly inspiring, and we are excited that the idea of Green Energy Doors Open is spreading and now includes other provinces, such as Alberta and British Columbia." “At Enbridge, we believe in sustainability and are concerned about the impacts of climate change. With and for our customers, we have worked for years striving to find innovative solutions to save energy and to improve the overall efficiency of their buildings. That is also why we started the “Savings by Design” initiative, which is a collaborative, multi-stakeholder approach to gain maximum energy efficiency in new building structures. We are proud to partner with OSEA on this campaign as it gives us the opportunity to inform the public about this part of our business,” explains Shannon Bertuzzi, Manger, Residential Energy Solutions of Enbridge Gas Distribution Inc.
For more information about Green Energy Doors Open and to read our blog, please visit our website (www.GreenEnergyDoorsOpen.ca) and follow us on Facebook (https://www.facebook.com/greenenergydoorsopen/) and Twitter (https://twitter.com/GEDOntario). Green Energy Doors Open is a province-wide, year-round communications campaign and a showcase of individual, community and commercial sustainable energy projects organized and spearheaded by the Ontario Sustainable Energy Association. The initiative aims to showcase advancements in the sector, demonstrating that Ontario is already on the path to building a 100% clean and sustainable energy system. Green Energy Doors Open takes place in Ontario, Alberta, and British Columbia. Last month, the Ontario Government finally released its long-anticipated Climate Change Action Plan. It is a 5-year plan to reduce Ontario’s greenhouse gas emissions by 15% below 1990 emission levels by 2020, 37% by 2030 and 80% by 2050. The Climate Change Action Plan (CCAP) is multi-faceted, wide-ranging and does not leave a single person or sector untouched. What is exciting for us at OSEA is that in its breadth and depth, it relates very closely to our vision and mission of championing a more sustainable Ontario with a decentralised, integrated and inclusive sustainable energy system. A system that is built on portfolios of sustainable energy technologies to power, heat, cool, and transport our communities. Municipalities across Ontario have been grappling, to varying degrees, with impacts of climate change and climate change mitigation. They are also always looking for new opportunities to bring business to their regions to ensure good, sustainable employment opportunities for the members of their communities. Thanks to the CCAP, municipalities are now being given the tools to undertake or further advance their Community Energy Plans. They are also being urged to undergo Community Energy Mapping initiatives to better understand their own contribution to climate change. Furthermore, municipalities are supposed to reduce congestions, create low-carbon, walkable communities and encourage the transition to electric or plug-in hybrid vehicles through improved city and land planning and regulations. Municipalities are further encouraged to work with the community to retrofit building stocks and set energy efficiency standards for new developments. The CCAP is also looking to increase biogas production providing municipalities with a first-class business opportunity for its municipal organic waste, landfill and sewer gas. For those municipalities who already have a Community Energy Plan with greenhouse gas pollution inventories a Challenge Fund or Program will be created to help match funding for projects to further reduce emissions, with the goal to “demonstrate best cost-per-tonne reductions”. The government seeks to collaborate and partner with indigenous communities to address the challenges of climate change and to identify areas of collaboration and actions. Major areas of consideration are questions around how to transition remote indigenous communities to low-carbon energy options, how and whether to connect indigenous communities to the province’s electrical grid and whether and how to develop micro-grid solutions for remote, Northern communities. Co-operatives and community organisations should seize the opportunity to work with their municipality to tackle the climate change challenge together. This could happen through the collaboration on projects to build out renewable energy generation and storage capacity, to finance energy efficiency retrofits, to develop low-carbon transportation options and to invest in and develop community spaces, such as parks and high-density living spaces, which reduce or sequester carbon emissions. Educational institutions are tasked with the important work of research and innovation as well as with establishing and delivering training programs to develop the expertise needed to fulfil the CCAP. In addition to that, educational institutions will be supported to upgrade and retrofit their own buildings and facilities and to include renewable energy and energy efficiency technologies. The CCAP aims to increase the renewable content in natural gas. This is great news for the agricultural and forestry sector for whom new business opportunities arise as producers of renewable natural gas for power generation, heating and transportation. Furthermore, the CCAP foresees to develop a land-use carbon inventory “to assess the potential of agriculture, forestry and other land uses, such as wetlands and grasslands, to emit, remove and store carbon.” It, therefore, seeks to expand the Greenbelt and protect the province’s grasslands. Biomass, water and wind power will be important elements of micro-grid solutions in communities that have an abundance of these resources, especially in remote, Northern communities. The building sector will see a drastic shift to improved energy performance and an emphasis on innovation for both existing buildings and new-builds. The government aims to introduce a new building code targeting net-zero emissions by 2030 and considers implementing initial changes by 2020. Homeowners, large commercial building owners and managers, municipalities, institutional and industrial facilities are encouraged and will be provided funding for a wide-range of measures to improve the energy efficiency of their buildings. Measures include upgrades to insulation, windows, boiler, chiller upgrades, as well as building automation systems. Geothermal and air-source heat pumps will become viable options for home and building owners who are looking for low-carbon heating alternatives. Building owners/managers and homeowners alike are being encouraged to consider on-site, renewable generation to offset their energy consumption, with a goal of reaching near net-zero emissions. Solar power generation will also play a factor in the development of microgrid solutions. The transportation sector is with 35% the sector with the highest carbon emissions, posing the greatest challenges and opportunities. The CCAP puts forward ambitious targets for carbon reductions from this sector. Most notably, the CCAP seeks to increase the number of electric vehicles (EVs), hydrogen and plug-in Hybrid vehicles in the province, through a number of incentive programs, including rebates for EVs, and the aggressive build-out of vehicle charging infrastructure. It further incentivizes the usage of low-carbon fuels by promoting fuel-switching, increasing the renewable fuel content in conventional fuels, and investing in public transit systems and short-distance railways. For the individual Ontarian, the CCAP has some very exciting things to offer. On the one hand, the CCAP seeks to introduce new (i.e. HER&D, Climate Change Tools) or improve existing (i.e. Green Button) programs and tools that provide accessibility to information on consumer behaviours as well as available choices to change these behaviours. On the other hand, it promises to support low-income individuals throughout the transition to a low carbon province and to generate new employment opportunities for the people of Ontario. The Climate Change Action Plan is a bold and ambitious plan to ensure that Ontario can meet its emission reduction targets. It remains the concern that the majority of the actions in the plan are tied directly to the proceeds of the Cap and Trade Program which will come into effect in January 2017. While we, of course, hope that the Cap & Trade Program will be successful right from the start, a less than satisfactory roll-out of the program could have negative effects on the implementation of the actions outlined in the Climate Change Action Plan. That said, the Climate Change Action Plan provides the people of Ontario with a tremendous opportunity to create new business opportunities and jobs. It also fosters collaborations between different sectors and stakeholders to ultimately build a better, more sustainable Ontario. OSEA has long advocated for such an integrated, comprehensive, and systematic approach and we look forward to working with our members and the larger community to seize the opportunities of the Plan. Through its large and diverse network of stakeholders with different backgrounds and from different sectors, OSEA is in the best position to do so. 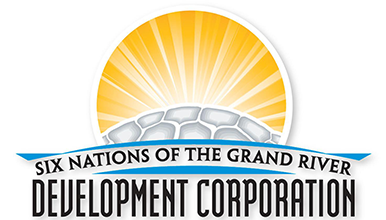 Six Nations of the Grand River Development Corporation (SNGRDC) was the recipient of the Aboriginal Project of the Year Award for 2016. The award, presented by the Ontario Sustainable Energy Association, recognises the significance of the 500-kilowatt (KW) Oneida Business Park Rooftop Solar Project. This initiative not only provides direct environmental benefits through solar energy production but also shows how local leadership can create strong partnerships for smart energy solutions and offer a wide range of social and economic benefits. The Oneida Business Park Rooftop Solar Project came to fruition as a result of the historic 2009 Ontario Green Energy and Green Economy Act. It was ultimately the result of a partnership agreement between Six Nations of the Grand River and the County of Brant. This agreement highlighted shared goals to develop sustainable community projects, draw attention to unresolved land matters, promote a stronger partnership between the two parties, and demonstrate Six Nations’ capacity as a viable and valuable business partner. SNGRDC holds a 90% ownership stake in the project and Brant County owns the remaining 10%. The Oneida project generates 500-kilowatts of energy through 2,307 installed solar panels. It can power approximately 77 homes per year (17% of homes in the region) while remaining carbon neutral. During its development and installation, members of Six Nations gained valuable employment opportunities and first-hand experience, which is one of the many direct benefits spurred through collaborative, community solar projects, such as this one. Over the lifetime of its FIT contract (20 years), the project will yield approximately $2.5 million in consolidated net cash flow to the community. The proceeds from it will be allocated to the Six Nations of the Grand River Economic Development Trust (EDT), which will invest in projects that will positively impact the Six Nations of the Grand River community as a whole. SNGRDC has also entered into other partnerships developing a diverse portfolio of renewable generation facilities. This portfolio currently generates 860+ megawatts of renewable energy through 13 solar and wind energy projects. Renewable energy investments are not only sound energy alternatives, but they also open the possibility for a brighter and more holistic economic future. The collaboration between SNGRDC and the County of Brant represents a model for localised sustainable development. This model has the potential to pioneer avenues for collaborations between municipalities and their neighbouring Indigenous communities that will foster collaboration, mutual learning and understanding while yielding environmental and socio-economic benefits. SNGRDC and the County of Brant continue to seek opportunities to collaborate on future projects that will further strengthen the relationship between the two communities and will allow them to build a sustainable future together. 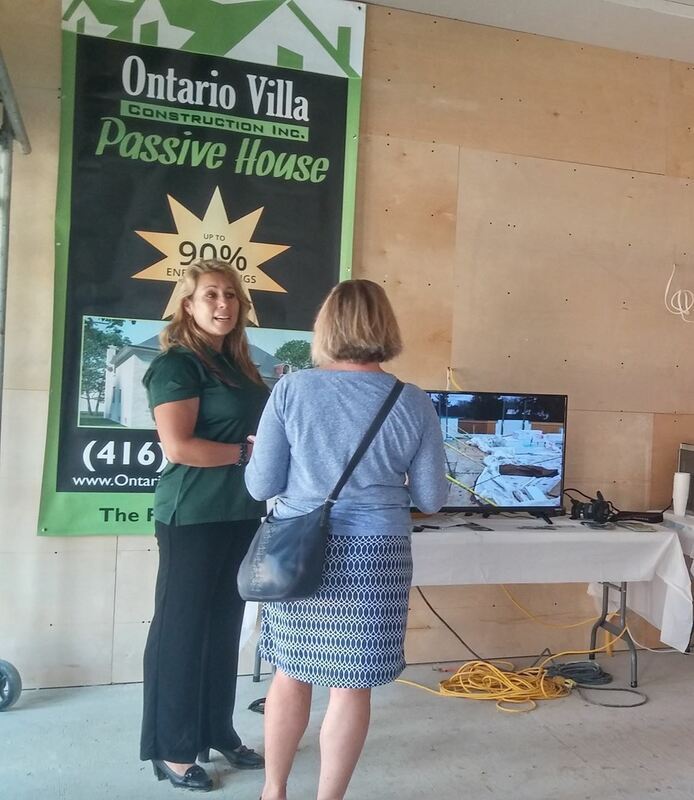 On Tuesday June 28th, OSEA hosted the Combined Energy Options Ontario (CEOO) Workshop. The study, aptly named “Combined Energy Options Ontario” - or CEOO - is in its initial planning stages. CEOO's goal is to model a 100% sustainable energy (electrical, thermal and transportation) system built on a portfolio of sustainable energy technologies, based on the needs and resources of Ontario’s different regions. The study will investigate how Ontario can cover the long-term energy needs while meeting its carbon emission targets and socioeconomic needs. The project is modeled after the Kombikraftwerk 2 project conducted by the Fraunhofer Institute IWES with great success and impact in Germany. Nicole Risse, Interim Executive Director of OSEA, started the day off by welcoming the workshop participants and giving a brief introduction of OSEA and the CEOO project. Workshop attendees comprised of OSEA members, academics and industry professionals, were then given a more in-depth overview of this project by the co-chair of OSEA’s board, Christine Koenig, who is also the principal instigator of this project. Christine explained that the timing is right for such a research project to be carried out in our province, since Ontario is currently at the point where it has to make important decisions about massive energy infrastructural changes. The CEOO project has a grand vision for Ontario to shift from its current centralized system, to a decentralized, integrated and inclusive energy system that is 100% sustainable by 2050. One of the primary objectives of this project is to discover when and how such an energy system can be realized, and whether it is economically feasible. In addition, the project aims to investigate economic, environmental and social opportunities surrounding a combined energy system, while identifying technological and political barriers to its implementation. Christine mentioned that an important outcome would be for the project to lend itself to effective public communication and education of key stakeholders and politicians, by emphasizing the potential and opportunities of such an energy future. Christine and the CEOO team have already consulted with their German partners who were involved with the Fraunhofer project, with hopes of learning how to leverage European best practices and provide benefits for our province. Since this initiative is in its early stages, some of the proposed next steps include: in-depth project planning, creation of a project organization (consisting of a steering committee and 6 working groups), and the formation of a project consortium. The consortium, which will include the Fraunhofer Institute, would consist of a variety of Canadian partners who can bring expertise or experience to CEOO and help see it to completion, either by contributing in-kind support or funding to the project. A final deliverable of the project would comprise an educational video and an interactive map of the combined 100% sustainable energy systems in Ontario. The workshop participants also had the rare opportunity to learn firsthand about Germany’s Kombikraftwerk project suite from Dr. Stefan Bofinger, a representative from the Fraunhofer IWES (Institute for Wind Energy and Energy System Technology). Stefan provided insight into the energy scenario in Germany, and the scope, structure and major outcomes of the study conducted by IWES. Ever since the renewable energy act was introduced in 2000, German households were able to install rooftop photovoltaic (PV) systems through the government’s feed-in-tariff program. Germany has since seen a significant PV growth - from less than 5% to 37% between 2002 and 2016; comparably, wind energy grew from 12% to 40% in the same time period. Close to 30% of Germany’s electricity system is now supplied by renewable energy, with wind and PV contributing a large proportion to this mix. 1. A German RES Power Plant project that scaled the energy demand in the entire country using real operations of RES power plants— demonstrating over a one-month period that their demands can indeed be met by these plants. 2. A simulation of a 100% renewable electricity future that models in detail the country’s future electricity generation and demands— using a mixed approach of PV, wind and biogas (determination of storage demand, generation peaks, surpluses from fluctuation and deficits were all included in this modeling). 3. The geographical analysis for possible renewable energy locations (i.e. wind, PV, bioenergy, and energy consumption sites), by evaluating a combination of criteria such as land use, land cover, topography, roads and infrastructure, characterization of offshore area, water depths, demography, and location of inhabitants. Outcomes of these studies implicated that it is highly possible for Germany to be powered with 100% renewable energy in the future. Stefan noted that Germany has a dense population, and the distribution and level of wind/solar energy potentials are less than optimal in many instances – therefore if such an energy future is feasible in Germany, it can be possible anywhere else in the world. He then proceeded to explain how this study can be made relevant to the Ontario situation, and elucidated how an ideal CEOO project should look like (i.e. one that adapts to the Canadian situation and involves all sectors – electricity, heating and cooling, transportation, and industrial processes). By the end of the workshop, OSEA members, academic partners and industry professionals were enthusiastic about the potential outcomes that the CEOO project would have for Ontario and the many opportunities for knowledge transfer between Canada and Germany. As Christine said, the time is ripe for our province to take charge and lead positive transformations in its own energy future. If our German counterparts can do it, so can we! 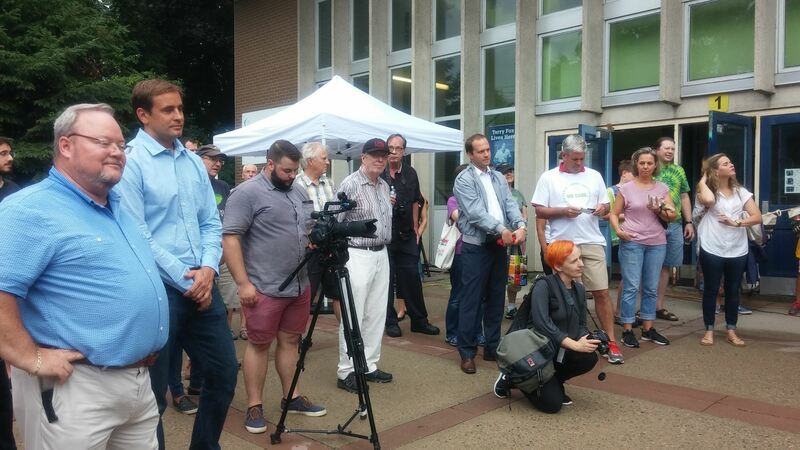 North Bay, ON - The leak of Ontario’s Ministry of the Environment and Climate Change draft Climate Change Strategy last week is both cause for celebration and for swift criticism. While it is both necessary and valuable for the province to actually develop a strategy to meet its aggressive GHG emissions targets, the current strategy commits to end Ontario’s residential use of natural gas for heating while the Ministry of Energy is actively promoting the expansion of natural gas throughout the province. It includes a narrow solution set of geothermal and electric heat while the Ministry of Northern Development & Mines and the Ministry of Natural Resources & Forestry actively promote the use of underutilized biomass residues for bioheat. Its stated goal of converting Ontario residences to electric heat in a time when the citizens of Ontario are struggling under the burden of rising electricity costs is both tone-deaf and a non-starter in the north. It’s most glaring omission, however, is that bioheat from renewable wood residues, the optimal solution for heating homes in northern Ontario, is absent from the strategy. Bioheat, and combined heat and power using renewable sustainable biomass, is a key plank in the climate change strategies of virtually every country in the northern hemisphere, and every other province in Canada. “The irony of the Ministry of the Environment and Climate ignoring bioheat in a province with vast forests, and that is internationally recognized and respected for its sustainable forestry practices is frustrating for northern Ontario communities and businesses. It’s doubly ironic as this week Biomass North Development Centre leads a delegation of community leaders, academics, and industry partners to World Bioenergy in Sweden and a bioenergy trade mission in Finland this week with the message that Canada’s bioeconomy is open for business,” said Dawn Lambe, Executive Director of the Biomass North Development Centre. “At previous World Bioenergy events, Ontario has been referred to ‘the black hole of bioeconomy development’. We had hoped to report to the global community on the progress that Ontario is making to reduce the regulatory barriers to bioheat through modernizing combustion guidelines and streamlining permitting, work currently underway in another branch of the Ministry of the Environment and Climate Change. However, our delegation will likely be asked how Ontario’s Climate Change Strategy can ignore the lowest hanging fruit of bioheat in a province with such huge biomass potential. We wish we had a logical answer to give them,” she added. When reviewing infrastructure and resource development projects in Canada, government leaders need to follow decision-making processes that are transparent, democratic, rigorous, and advance sustainability. For decades, two closely linked procedural policy tools-environmental impact assessment and mechanisms for public participation in decision-making-were thought to possess these qualities, and to offer the potential to balance the often conflicting interests of stakeholders in development projects. 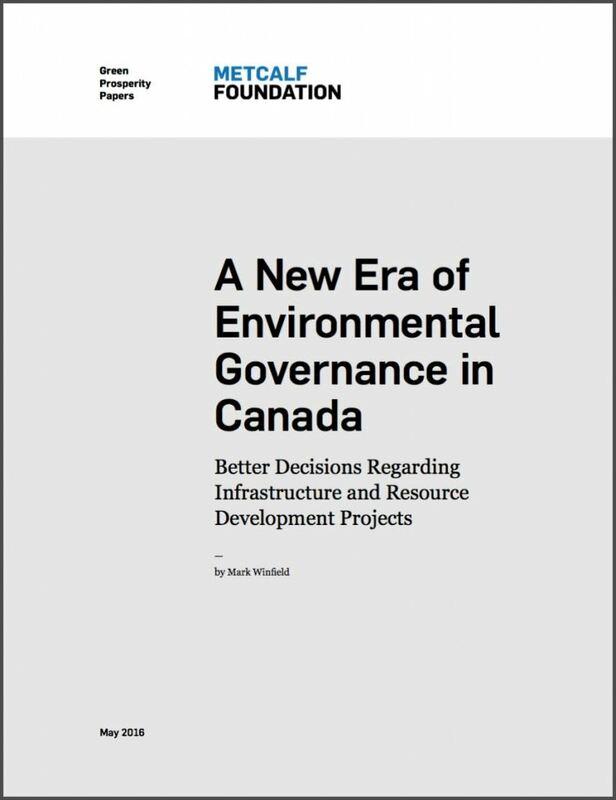 However, Mark Winfield argues in A New Era of Environmental Governance in Canada: Better Decisions Regarding Infrastructure and Resource Development Projects that these tools have largely lost their legitimizing power due to government "streamlining" efforts that accelerate project approvals. As a result, affected communities and aboriginal peoples, non-governmental organizations, and even groups with economic interests in development outcomes no longer accept the decisions made using these processes. Rather than facilitating speedy approvals and moving project construction forward, streamlining has had the opposite effect, resulting in greater uncertainty and delay. Winfield's paper charts the emergence and decline of these two procedural tools, and offers clear recommendations for how contemporary policy makers and political leaders may restore public confidence in their environmental governance. A New Era of Environmental Governance in Canada is the first paper in the Metcalf Foundation's Green Prosperity series. Five papers will be released in the coming months, addressing a range of issues and opportunities in building a low-carbon, resource efficient, and resilient Canada. 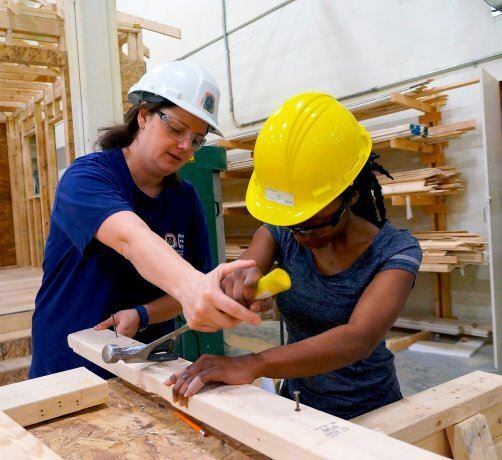 The College of Carpenters and Allied Trades (CCAT), located at Carpenters' Local 27's training centre in Vaughan, Ont., has set up a mentorship program that gives women entering the trade an opportunity to share their experiences in the male-dominated field with experienced female carpenters. "Developing coping strategies right from the outset is paramount," says Kathryn Trickett, 33, the new program's lead mentor and an instructor at the training centre. "A lot of women entering the trade don't have coping and soft skills to work in a male-dominated industry." She notes the attrition rate of women in the trades is much higher than that of men. Trickett, a Red Seal certified carpenter in the trade for 10 years, says an example of soft skills is when men try to help women by doing some of their work for them. "They might not realize it but they are taking away work from those women," she says. Women on the job have to learn to stand up for themselves - often that means declining offers from men for help, she points out. "When they do the same work as the men, that is when they gain their acceptance and respect." The mentoring program offers female students opportunities in class and after to sit down with their peers and mentors to discuss issues, which might go beyond experiences on the job with men. "Looking at the logistics of how to keep the job when they start having a family is a real concern as well," says Trickett, a mother who takes her two-year-old son to daycare at 5:30 a.m. before heading to work every day. "We have women just coming into the trade and women who have been in the trade for a couple of years that we are mentoring," she says, adding some women come through the Ontario Youth Apprenticeship Program (OYAP), a school-to-work transition program, for example. One of two staff mentors, she says the initiative was set up to provide peer-on-peer mentoring. Students with a couple years or more of training also assist new apprentices. The mentoring program offers regular group meetings where female students can air their concerns. Once on the jobsite, follow- up meetings will be conducted through social media formats such as Facebook. 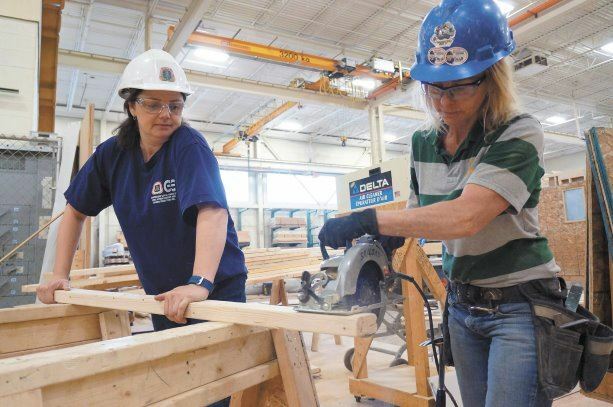 Trickett says the mentorship program is in part spawned by a Canada-U.S.-wide goal by the United Brotherhood of Carpenters to increase the number of women in the trade from about 3.5 per cent today to 20 per cent in 2020. To help meet that goal, parents and high school guidance counsellors have to be more open about a career in the trades for their daughters (and sons). Many students turn to the trades because they couldn't land good-paying jobs after graduating from university or college, Trickett points out. "The average age of an apprentice is 28. We want to see that age drop because trades apprenticeship is truly the third post-secondary destination," she explains. Kathy Bedard, an apprentice at the intermediate level at CCAT, is a peer mentor to new apprentices. Bedard, who raised a family before getting into the field three years ago, offers advice to women in class and entering their first jobs in the field. At CCAT's floor-covering apprenticeship program, Laura Graham-Sawchyn is an instructor and mentor to female students. The first woman with a Red Seal certification in the floor-covering trade in Canada, the 26-year-old says it is important for women on new jobs to let their supervisors know if they can't do certain physical tasks. But it is equally important to tell supervisors the tasks they can do as well as the men. Trickett says some men on jobsites want to "rescue" a woman - particularly a small one - from an arduous physical task. She advises those women to hold their ground. "It's not about being a woman, it's about being good worker," she says. CCAT's mentoring initiative applies to all apprenticeship training levels and other programs taught at the training centre in Vaughan such as the eight-week course for students in OYAP. OYAP students completing the eight-week course receive an additional two weeks of "job-ready" training at CCAT, says Trickett. The CCAT then assists students in finding jobs. "Depending on the year and factors like the economy, we place everyone who wants to be placed on paid union jobs," she adds. Regarding the story, Nicholls and McNaughton believe Green Energy Act is hurting Ontario (March 11). When Ontarians are realizing that weather extremes caused by climate change are starting to affect them directly, it's especially discouraging that some of our leaders do not recognize the value of a policy such as the Green Energy and Green Economy Act (GEGEA). The policy was created to jump-start renewable energy generation and encourage the manufacture of related equipment at a time when traditional industries were declining. It was structured to encourage the proliferation of local benefits in clean energy and jobs. When introduced in 2009, the Feed-in Tariff programs were considered worldwide as ground-breaking regulations that allowed for real community participation, putting Ontario on track to becoming a renewable energy powerhouse. That potential was never fully reached, and we can now only point to a few examples of maximized community benefits. Since the introduction of the policy, politicians and entrenched energy interests have used fear, uncertainty, and doubt to spread misinformation about costs and impacts on energy prices. Unfortunately, this largely unchallenged criticism has put the focus of the conversation solely on the cost of electricity, ignoring other important benefits of a decentralized, sustainable energy system. MPP Monte McNaughton is quick to repeat the unsubstantiated claims that "[wind turbines] are the single biggest driver that's adding to the price of electricity." Considering that some wind project contracts in the recent Large Renewable Procurement come in at a price of $64.50/MWh, which is lower than the lowest initial price estimated for the refurbished Bruce Nuclear reactors (which comes in at $65.73/MWh), this argument falls flat. Furthermore, he ignores data from the Independent Electricity System Operator that indicates nuclear and natural gas as the leading cause for increases in the Global Adjustment charge. We have seen prices for renewable energy and cost of equipment come down dramatically over the last decade. Increasingly, many jurisdictions are reporting their wind and solar projects are starting to operate on par or even better than their centralized, fossil-fuel energy generators. And now, we even see the myth that nothing can be as cheap as nuclear, which in itself is a highly disputed claim, being dispelled as renewable energy projects challenge the "published" price of nuclear power. McNaughton and MPP Rick Nicholls should realize that Ontarians need to embrace the concept that sustainable energy is the solution to building a prosperous province with good jobs, resilient communities, and healthy environments. Last night, the Ontario Sustainable Energy Association (www.ontario-sea.org) celebrated its 6th annual Powering Prosperity Awards dinner (www.poweringprosperity.ca), recognizing the champions of the sustainable energy sector, and celebrating the achievements that help advance sustainable energy within the province of Ontario. "The Powering Prosperity Awards is an annual fundraising dinner hosted by the Ontario Sustainable Energy Association to shine the spotlight on sustainability and sustainable energy development in the province," said Joe Mulhall, President of the Canadian Union of Skilled Workers. "Our members believe that building a sustainable, decentralized energy system creates good jobs, generates local economic opportunities and contributes to a healthy environment." The evening brought together an illustrious crowd of the Who's Who in the sustainable energy industry. It was kicked off by Atul Mahajan, President and CEO of Oshawa Power and Utilities Corporation (OPUC) who delivered a poignant keynote speech about the important and ever-changing role of the utilities in the development of a sustainable and decentralized energy system that will allow consumers and generators of energy to interconnect in ways that are much more flexible. He highlighted in particular the great success OPUC is seeing from its solar PV and storage pilot (http://www.opuc.on.ca/sems-pilot-program/). "Our vision is of a prosperous Ontario with a thriving sustainable energy sector, good jobs, resilient communities and healthy environments -powered, heated, cooled and moved by portfolios of sustainable energy. Events like Powering Prosperity and Green Energy Doors Open showcase the individuals, communities and businesses that are helping make this vision a reality," states Nicole Risse, Interim Executive Director of OSEA. Risse added, "Today we celebrate the winners of the 2016 Powering Prosperity Award, as well as the achievements of everyone that is active in the sector, each working toward building a better future for Ontario." Mayor Randy Hope from Chatham-Kent took home the prestigious 20/20 Leadership Award, being recognized for his leadership in promoting sustainable economic growth in his community with green energy and community engagement as a priority. The Developer of the Year Award went to Whitesand First Nation, a far-northern First Nation community who has worked very hard and over many years to get the permission to build a 3.64 MW combined heat and power biomass plant, which will provide electricity to three communities. In 2016, Whitesand First Nation is expected to begin construction on the project that will provide the region with a steady stream of revenue, local jobs and an ample reliable, clean supply of electricity. The SMARTpreneur of the Year Award category recognizes the achievements of entrepreneurs in the sector. 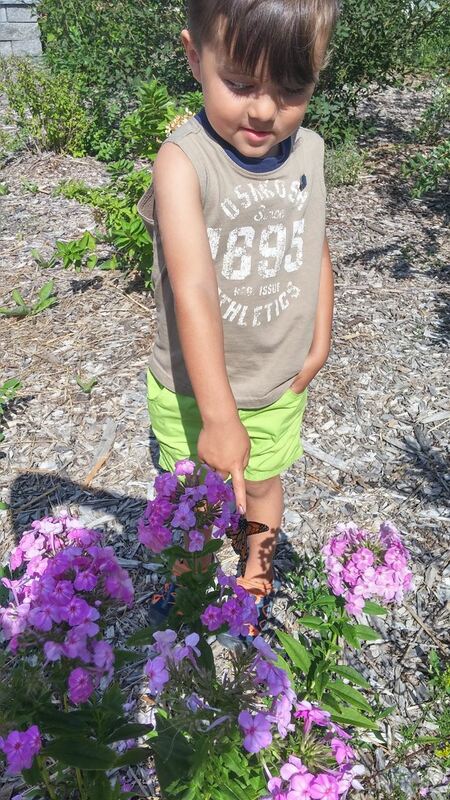 In 2016, Brant Municipal Enterprises was awarded the prize in recognition of its pursuit to bring socially beneficial activities, including the development of a renewable energy portfolio, conservation initiatives and the development of a progressive fibre optic network, to its community. The Sustainable Project of the Year Award went to Ernestown Windpark, a development by Horizon Legacy Group. Ernestown Windpark is a small, low impact, 10 MW facility that is partially owned by a First Nation community and located near Kingston, Ontario. Six Nation of the Grand River Development Corporation (SNDC) received the Aboriginal Project of the Year Award for its profound commitment to renewable energy in Ontario. To date, SNDC has direct ownership in a portfolio that exceeds 600MW of installed wind and solar generation locally, generating revenue for the community and creating jobs for their people. The Senvion Community Project of the Year Award saw two distinguished winners. The first one was Camp Kawartha, who was recognized for the leadership in growing sustainability awareness amongst students of all ages. The second recipient was the Ottawa Renewable Energy Co-operative (OREC). In September of 2015, OREC completed a solar project on the rooftop of Maurice Lapointe High School in Kanata's Bridlewood neighbourhood, which was Ottawa's 1,000th solar rooftop installation. The project is 100 percent owned and financed by Ottawa residents through OREC's community-based business model.